We pick up right where the last episode left off with Chad talking to Chris Harrison and re-entering the house to make amends. Evan asks for a new shirt and apology; Chad's like fine, I'll give you twenty bucks and promises he won't get violent. The end. JoJo arrives at the house for the all day pool party, where it's all laughs, margaritas, and ogling JoJo. Somehow Evan gets a nosebleed diving into a pool because he's that guy. JoJo gets more time with Jordan and she's totally into him already and isn't sure he's as into her, which makes her nervous and Jordan realizes he needs to show his vulnerability. Chad defends his earlier comments about Evan, but Evan interrupts yet again and out comes pissy Chad. And when he overhears Derek talking about him, Chad decides to confront Derek. Derek thinks Chad is there for TV and while he hasn't been violent yet, he sees it as a possibility; Chad just wants to be left alone. Well he'll have to tolerate the guys a little while longer because he receives a rose, much to the chagrin of the others, and instead JoJo eliminates Christian, Ali, and Nick. 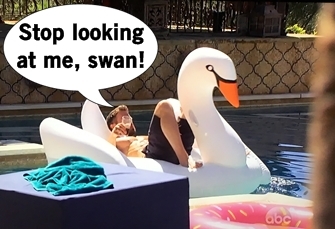 The guys depart the Bachelorette mansion for their big adventure of love starting with... Nemacolin, Pennsylvania. Guys I have no idea where it is either but apparently it allows for JoJo to arrive in a tiny plane and the guys can go muddin'. 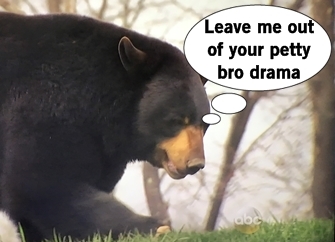 Chad takes some alone time, as usual to sit and ponder, and hopes the guys don't poke the "Chad Bear" as the show cuts to a shot of a wandering black bear. Spirit animal power activate! And then he bickers with the guys a lot more, but I'm tired of recapping it so you can just imagine Chad arguing with the guys over and over and threatening to fight them outside. 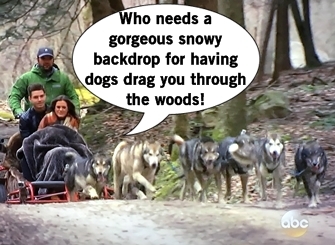 Luke receives the first 1-on-1 date in beautiful Pennsylvania where they go dog sledding, but on land because the show is too broke for Alaska I guess. That lasts for 30 seconds before hopping into a wood fire tub AKA rustic hot tub that they overheat with too much wood. JoJo likes that Luke is attractive but also a country boy. That night, the couple head to their private dinner where we get backstory of why Luke seems like a mysterious drifter in the night. Turns out he was recruited by West Point to play football and eventually deployed to Afghanistan, which matured him a lot. After a friend died, it made Luke value life for every minute. JoJo emotionally connects with Luke, giving him the date rose and surprising him with some slow dancing in front of a loud iPhone pic snapping crowd at another exclusive concert. JoJo is totally smitten with Luke. The group date guys get to peace out of Nemacolin and head to Heinz Stadium in good ol' Pittsburgh for a football date. "Big Ben" Roethlisberger, Heinz Ward, and Brett Keisel are there to train the guys and make them run drills. I know Big Ben is a Pittsburgh hero but I think his criminal background should have maaaaaybe omitted him from a show about dating. Back to JoJo's guys. They play hard to impress and win time with JoJo. James Taylor cuts his head and gets bandaged (someone check him for CTE!) and yet again Evan gets a mysterious nose bleed. 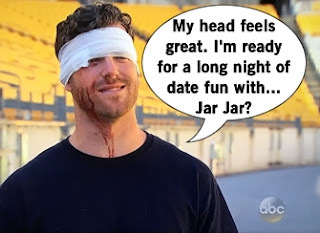 Since he was a former NFL quarterback, Jordan gets to be on both times and guarantees himself the night portion of the date which must make JoJo very happy since the team that won is mostly guys she's clearly not into. The winners get a cocktail party to get their earned JoJo time. Robby has had little time with JoJo but apparently they feel a mutual connection, so he lifts her onto the pool table to makeout which is so cringey. JoJo wants Jordan to be more vocal about his feelings because he's hard to read, so he explains in front of a water fountain that he's falling for JoJo and they kiss. Jordan gets the group date rose which is no surprise at all. In a wonderful stroke of evil genius, the produers put rivals Chad and Alex together on a 2-on-1 Thunderdome date. Two men enter, one man leaves! Before departing for the date, Chad gives some threatening parting words to threaten Jordan - then heads out for some romance! Chad and Alex are flown in a helicopter (H.R.E.A.M.!) and meet JoJo in the middle of nowhere for a hike. Giving the guys a machete and axe is also an excellent idea. The trio sit down for an extremely uncomfortable level of silence before splitting off for alone time with each guy. Alex uses his time to rip on Chad so that he can't manipulate JoJo, who is surprised to find out Chad's a lot more ragey than she realized. In her alone time with Chad, JoJo expresses her confusion at all the threats she's heard about and he tries to kinda deny/kinda finesse the story. 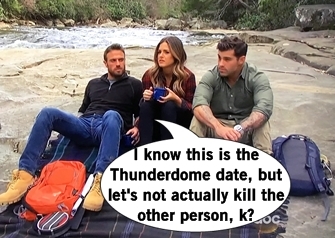 JoJo doesn't like the threats of violence as a way to deal with emotions, and when she leaves Chad takes his anger out on a poor camping mug and throws it into the river. Chad heads back to tell Alex he's not mad but disappointed (such a dad-like move) and they get into it, AGAIN. JoJo ain't down with the physical violence threats so she dumps Chad and gives the date rose to Alex, leaving Chad alone in the woods and I hope they left him a tent. The men celebrate with champagne and confetti poppers at Chad's demise. But just when you think he's gone, he ain't! There's a knock on the front door AND a creepy squeaky finger drag. IT'S CHAAAAAAAAAAAAAAD.